Dakota (Taj Ruler), Rose (Brittany Bradford) and Brenda (Jevetta Steele). Photo by Rich Ryan. The Center of the Margins festival at the Mixed Blood Theatre has the admirable mission of producing plays involving populations that we don’t often see on stage. My Secret Language of Wishes, the second play to premiere as part of the festival, centers around a seventeen-year-old girl with cerebral palsy and the women who, to varying degrees, learn to care for her. 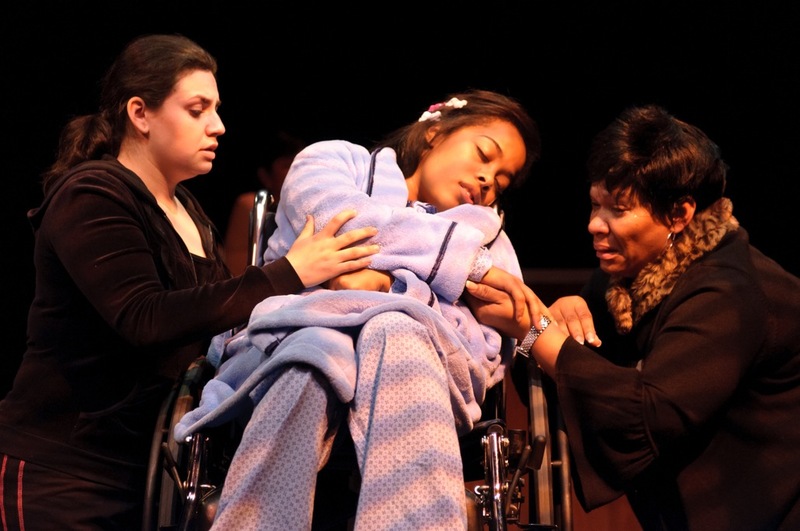 Although the script – an all-out tearjerker by Cori Thomas – presents some significant ideological issues surrounding the portrayal of disabilities, Brittany Bradford‘s performance as Rose feels stunningly real, lending a human face to a disability that is rarely ever explored in the media. The central conflict of the play is between two women fighting to adopt Rose: rich forty-something Brenda (an utterly charismatic Jevetta Steele) and Dakota, the twenty-four-year-old aide at the group home who has cared for Rose for six years. (Taj Ruler plays the part with a fierce desperation that makes the character’s struggle poignant and believable.) The arguments for each side are being brokered by Jo (Signe Harriday), a high-powered lawyer who is having her own troubles keeping both her receptionist (a very relatable Mo Perry) and her domestic partner (Nora Montañez, whose considerable acting talents are limited by her character’s overwritten need for a baby). Unfortunately for the talented cast on stage, the script is so melodramatic that the actual experiences of being, living with, and loving a person with disabilities get lost in the stream of heartfelt pleas and un-winnable arguments. The (rather predictable) plot twist only serves to make the play more about maternity than about the actual issues faced by Rose and her caretakers. The focus on motherhood would not be such a problem if it were not ultimately presented as the uncomplicated solution to life’s interpersonal problems; however, the play opens up so many challenging questions concerning parental responsibility that it feels cheap to tie them up so neatly. The play also falls into the common trap of placing some of the smartest and most philosophical lines in the mouth of the person with disabilities. While purporting to honor the experience of an individual with cerebral palsy, “My Secret Language” has used Rose as a vehicle to play on the audience’s sentiments. The special needs community deserves honest portrayals of characters that have flaws and weaknesses, as we all do – after all, isn’t that exactly what the Center of the Margins festival should be for?